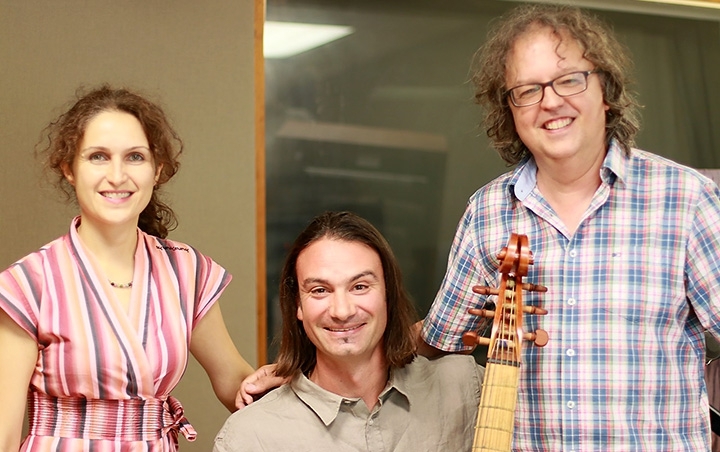 Viola da Samba is an ensemble creating a bridge between Renaissance music and Brazilian music. The group uses the pure sounds of early instruments to revive the past while embodying the rich and vivacious harmonies and rhythms of samba and bossa nova. They will be performing this weekend in Richmond, Saturday at the Black Iris Gallery (4:00 p.m. workshop and 8:00 p.m. concert) and Sunday with the Richmond Concert Chorale at St. Mary’s Episcopal Church (3:00 p.m.). The trio features soprano Nadine Balbeisi, Fernando Marín on the viola da gamba and Jean Kleeb at the clavichord. They stopped by our WCVE Music studio to perform several selections on the air, and were joined by Ryan Tibbetts, Director of Music for the Richmond Concert Chorale.